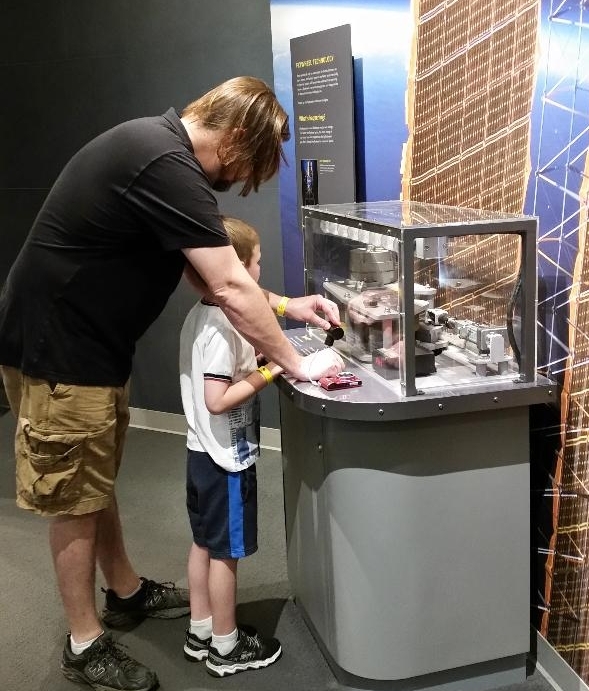 I received free tickets to attend the science center with my family. All opinions are my own (well, or my kids'). I've got to start out by saying how great Cleveland is! There is so much to do. Hubby and I got to visit for a weekend years ago when I worked for Quicken Loans. They were renaming the old Gund Arena to the Q, and Quicken brought all of its employees to Cleveland for the celebration. We had tickets to several major attractions, a hotel for the overnight stay, and a giant party at the arena. So we knew we'd enjoy going back to Cleveland. 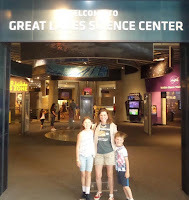 We decided to check out the Great Lakes Science Center this time, and we are so happy we did! Just to the left of the main ticket window, we entered the science center to see several space exhibits. 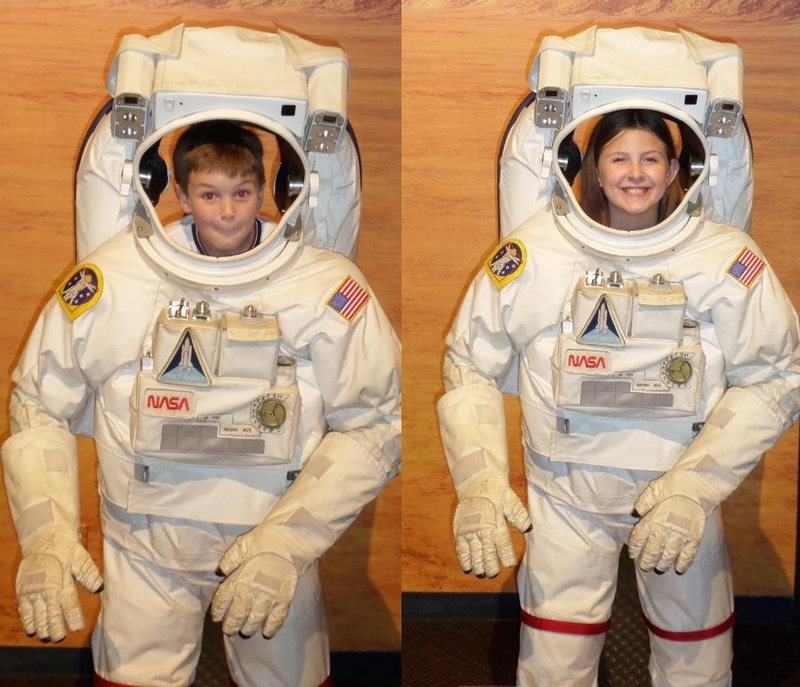 The kids and I were surprised to see one of the space suits on display had the word 'Eva' in the title. Is this where Wall-E's girlfriend got her name? I'm really not sure. I'm always concerned when I go to things like this that I'll have to 'fake' enthusiasm for the kids, but I think this was seriously the best science center we've been to. There were so many exhibits, and most of them worked exactly like the accompanying signs said they would. After going through the areas with the space exploration exhibits, some goodies about energy, and fascinating things about genetics and the human body, it was time for our Dome theater movie. At the Cleveland Clinic DOME Theater, we chose to see the 'Amazon Adventure' movie. It took us on a journey through the life of Henry Bates, his 11-year adventure in the Amazon, and his exciting discoveries for biology. We picked this movie because we expected it would engage our kids more, but hubby was a little disappointed that he didn't get to see 'America's Musical Journey' instead. Maybe next time! We were all happy at the snacks for sale so we could eat a bit while enjoying the show. What's a movie without popcorn, right? When we exited the theater, we found ourselves entering all the hands-on exhibits. And there were so many different things to try! Most of them were perfect for my ten-year-old. My six-year-old son liked a little help, but then he could appreciate and enjoy things. I particularly liked playing with the kids in the flash room (where you could momentarily 'freeze' your shadow on the wall). 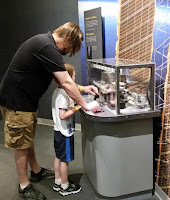 While my daughter's favorite things at the science center were the movie and the hands-on exhibits, the best was yet to come for my son. 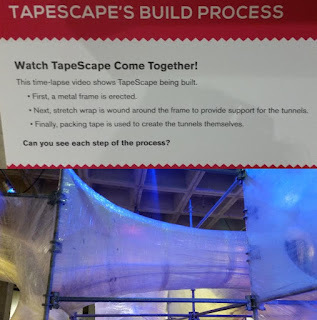 We headed down to the level we'd originally entered on to find the TapeScape. This is an exciting exhibit you don't want to miss! The TapeScape was built from stretch wrap and TAPE around a metal frame. It's big enough for kids of all ages to tour through (but I'll warn you, the slide at the end frequently makes a loud sound that could be confused for a fart. LOL). My kids both went through this again and again. My son still spent the whole next day saying he wanted to do our visit over again. Would I recommend visiting the Great Lakes Science Center? I can only answer a big YES, along with my hubby and two kids. This was a great experience with something for everyone. Check out the Great Lakes Science Center website for details before your visit, and let me know what you think! We did an overnight in Cleveland and went to the aquarium. It was a blast! Such an easy trip from Detroit. That looks like a fun time. I've actually never been to Cleveland! I've been wanting to go there! It looks like so much fun. I'm a total nerd for science museums! Such an amazing place to visit. Love it truly! Great time indeed!